Eau Eternelle, the first release from the new independent fragrance house S Poncet, is described as a perfume of "never ending exhilaration." The S Poncet website lists its notes as lemon, mandarin, grapefruit, petitgrain, lavender, rosemary, patchouli, sandalwood, and moss; additional notes (via Beautyhabit) include jasmine, carnation, lotus, clove, patchouli, and guaiac wood. Its sources of inspiration, according to founder Sabine Poncet, are a child-like painting of swimming fish and memories of Monet's garden at Giverny. Eau Eternelle opens on a cluster of citrus-floral top notes with a fizzy, aldehydic kick. Its initial phase also seems to include an ozonic-aquatic note with a hint of melon; it's not my favorite thing to encounter in any fragrance, but it fades away before long. In the heart of the fragrance, jasmine and lily are most prominent, and I'm wondering whether some rose might be hovering there as well. Eau Eternelle has a slightly mossy base under the extended floral notes. It's a "perfume-y" perfume, quite feminine, and not as fresh or watery as the description (or the opening notes) would suggest. It has a somewhat old-fashioned sensibility, which is a good thing in my book. It reminds me vaguely of some French white-floral perfume of the 1970s, perhaps something that Coty or Caron would have released during those years. It works as a casual-chic daytime fragrance, but it could easily make the transition into evening. Lastly, a close look reveals that S Poncet's logo is the mayfly, an insect belonging to the order Ephemeroptera. Ephemeros, the Greek word for "short-lived," is also the official name of Poncet's company. It's a thoughtful and lovely metaphor for fragrance or any fleeting pleasure. 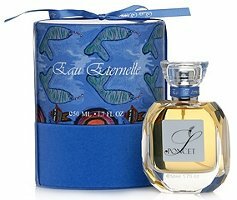 S Poncet Eau Eternelle Eau de Parfum ($115 for 50 ml) is available at Beautyhabit, Indiescents, and the S Poncet website. 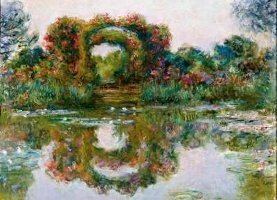 Note: image is Claude Monet, Flowering Arches, Giverny (1913) [cropped] via Wikimedia Commons. In a crowded market S Poncet is clearly trying to carve a spot for itself among ‘discerning’ women, perhaps somewhat conservative int heir tastes, but with plenty of money to spend. Not that this fragrance is scary-expensive, but the scarf and jewellery are certainly way out of my budget. This is Hermes territory, I perceive. Still, the perfume sounds lovely. Old fashioned is good in my book too. For casual chic, I’m in White Linen today. Unbeatable. Ah, White Linen. You know what I mean by “casual chic,” then! The Eau Eternelle scarf and jewelry are beyond my own budget, too, but I suppose a serious scarf collector might not feel the same way. I’m glad the fragrance has a reasonable price (for a niche fragrance)! This fragrance seems to be complex: florals, fruits, mellon, aquatic, old fashionned. Interesting for lauching a new brand. It’s refreshing to see a brand starting with *one* fragrance rather than six or eight, isn’t it?! Tottaly agree. Sometimes just one “intelligent” lauching values more than 8 ones. And nowadays that’s a different and daring way to make things. Any other information about the brand?? Is it greek? Were will it be available? The creator, Sabine Poncet, is French-born, and the company is based in the U.S. I think the S Poncet website has a list of stores, and Beautyhabit and Indiescents have just picked up the line as well. You were faster than I. I would modify one of my questions but you have already aswered my imaginary question: Thinking transmission! Thanks. I was fortunate enough to win this as a sample, and it is very pretty. I am using it sparingly to conserve! It is tres chic and I don’t know why, but it reminds me of Audrey Hepburn. My personality is more like the other Hepburn (Katherine), but I can appreciate this pretty fragrance. Taffy, I can imagine wearing it with an Audrey Hepburn-like outfit: capri pants, ballet flats, a neat white t-shirt, and the matching scarf! I have a bottle. I adore the packaging and the very pretty bottle. The fragrance is subdued and will have a following, probably with a more mature group than the candy/sweet/teenybopper crowd. Or as Luca Turin commented on another fragrance: “rich women who wear beige”. I do get the little grapefruit, or maybe ozone-melon bit at first and alarmed me that it was going to persist. It didn’t. The lily seemed to take over and then the moss. I agree with the comment about it being perfumy. It really isn’t quite what the copy seems to suggest. But it’s quite nice. Not life-altering. I’m actually looking forward more to the second release with the wet earth and decaying mushrooms. Now that sounds interesting. Ikat, you’re right: even though it’s a pretty floral, it’s not dumbed down. We seem to have had similar experiences with its notes! I need to test this again but I found it a bit confused and undefined, like it wasn’t sure what it wanted to be. I was vaguely put off, but I’m not sure by what. I was briefly put off by the aquatic-ozone note, so I was glad it didn’t last!